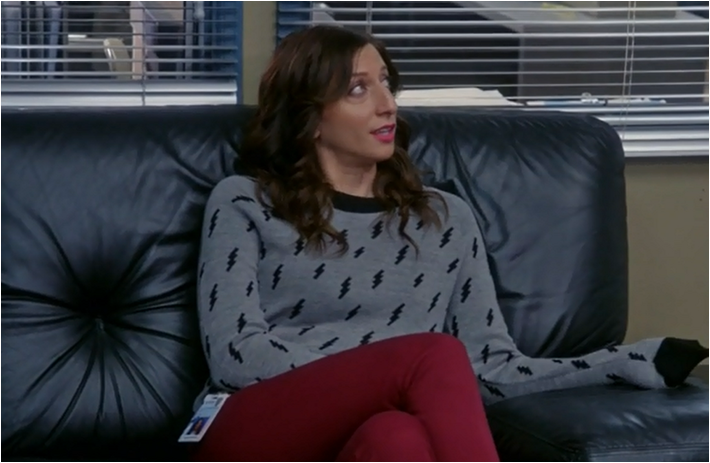 It looks like we have a rival to April Ludgate as the character whose wardrobe we covet the most and the character in question comes from another Mike Schur co-created show as Chelsea Peretti’s Gina adds another couple of sweaters to the wish list she is already on. 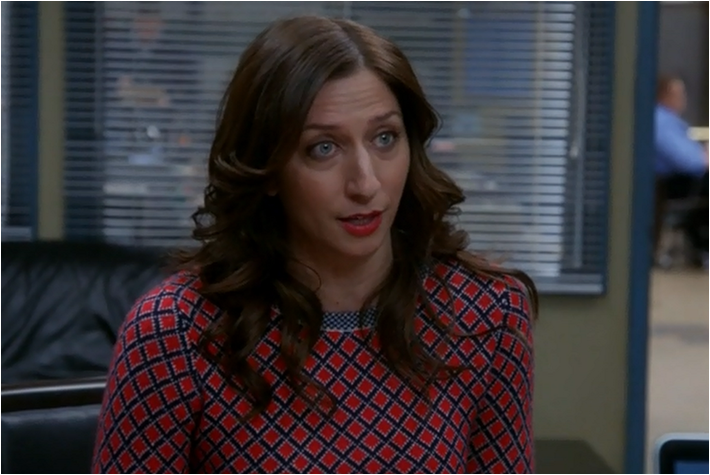 Both the new wish list additions feature on the recent episode of Brooklyn Nine-Nine and while I probably wouldn’t wear the Floorgasm attire, Gina is quickly turning into a TV Ate My Wardrobe favorite. First up this lightning bolt sweater adds weather whimsy to your outfit and it’s from A.L.C. Plus it looks great with red pants if you want to brave the colored pants thing – and you really should – mustard pants are what I’m currently after (not to be worn with the mustard hoodie when I eventually find the perfect one). Gina’s wearing really fantastic lipstick too and it adds another pop of color to this ensemble. This diamond sweater is from J. Crew and it’s cashmere so not only does it look awesome, it also feels incredible. An itchy sweater is terrible no matter how fantastic it looks and you won’t have that problem here. More great lip color too. And Gina’s right, she does have great hair. Does anyone know what lipstick this is?